Jyothi could be on track for sporting stardom! 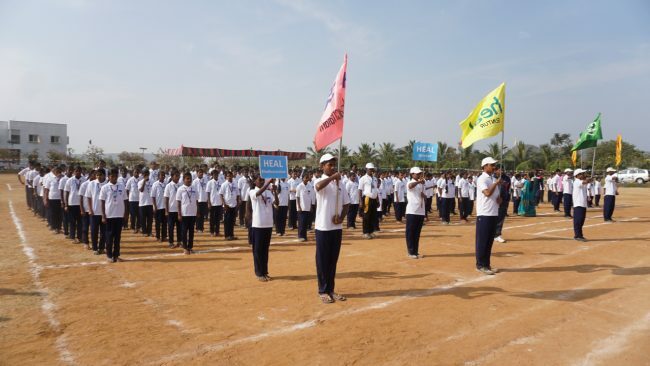 One young student has become something of a celebrity at Paradise Village lately… ninth-grader Jyothi is the talk of the school after being selected for state-level sports academy training in the popular Indian sport of kho-kho. Jyothi missed most of the recent HEAL Silver Jubilee celebrations at Paradise Village after spending a few days rubbing shoulders with the cream of the Andhra Pradesh sporting crop. It was quite an eye-opening experience for the teenage athlete, with standards at the training camp obviously higher than anything she had encountered before. Jyothi returned with a new sports bag, a trophy, certificate and some prize money after her team claimed runners-up spot at the academy try-out. 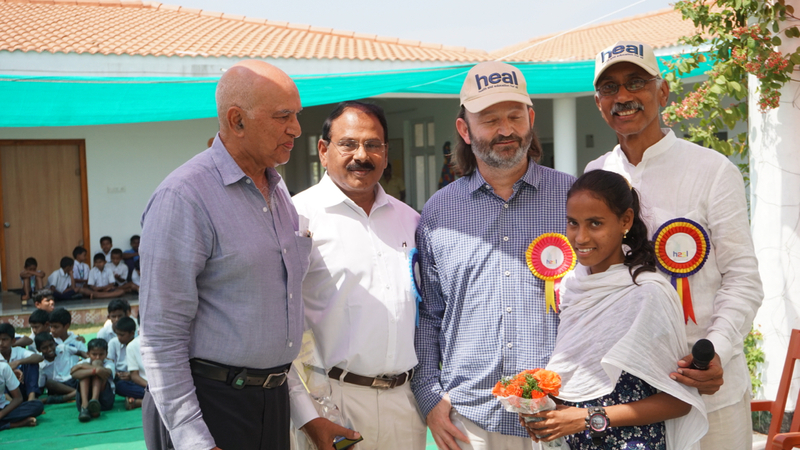 And HEAL founder-chairman Dr Satya Prasad Koneru was quick to lavish praise on the promising teenager as he called her up onto the stage to be honoured in front of her admiring classmates by HEAL Day chief guest Mr Moncho Ferrer. Her picture is also posted up around the school and she has even featured in one or two newspaper reports in the Telugu Press. 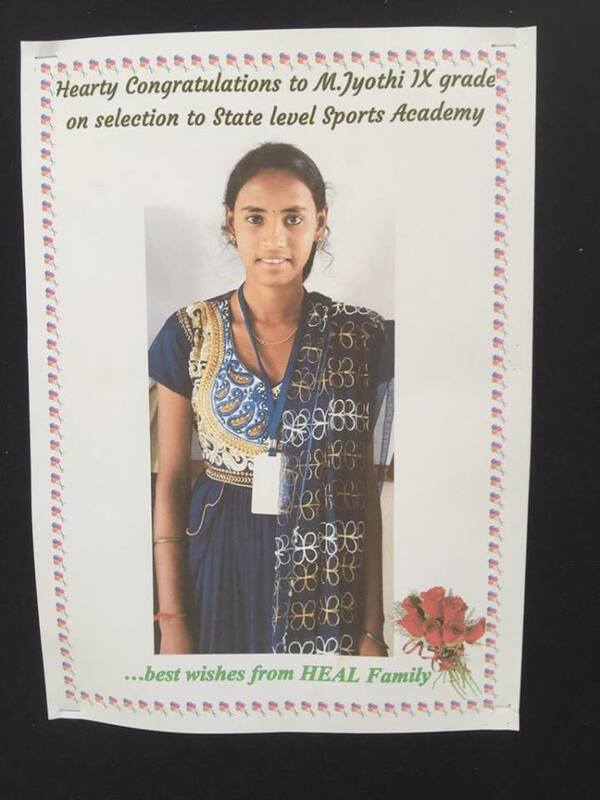 Such achievement as Jyothi’s gives immense satisfaction to all HEAL staff and volunteers as it serves to demonstrate how children from severely disadvantaged backgrounds can go on to make their mark in life if given the right start. Jyothi arrived at HEAL in distressing circumstances, as she said in a recent newspaper report: “I did not know my father at all. When my mother died in a traffic accident, I was all alone with no place to call home. Fortunately, some relatives joined me at HEAL. This is not something I could have ever dreamed of. It is now my home, family and future. But Jyothi is not letting her successes go to her head and remains determined to press on with her studies – even at the expense of sporting success. And whatever path she decides to take, she knows that her HEAL family will be behind her all the way! Today we are celebrating our Silver Jubilee and it is a red-letter day in the HEAL journey. Having started in 1992 by Dr Satya Prasad with two abandoned children, HEAL in the last 25 years has benefited thousands of children. More than 100 have become engineers, doctors, MBA, graduates and some have become entrepreneurs. HEAL aims to support 10,000 children in this decade. HEAL believes in learning by doing. This year every classroom has been converted into a lab. We now have labs for every subject. The classroom has become an interesting area. This is in addition to the existing well-equipped maths, physics and chemistry labs. We are now looking forward to upgrading our biology lab. HEAL School strives to keep in pace with changing technology and aims at an engaging and involving environment. We now have three ‘smart’ rooms and all three of those are over-booked by our teachers. All our teachers prefer to mix teaching with visuals. Result? Our attention span and retaining capacity has increased. We are now looking forward to make every room a smart room as and when we receive donations. Stories transport us into a different world. We love to read stories, no matter whatever the age. Our library has become interesting and attracts more and more children. Our library is open on Sundays also. Nurturing innate abilities: Our entire campus has become a learning space for us. Six-day schooling has been made into five days to use Saturdays to pursue our hobbies. There is dance, music, drawing, games, elocution, debates and robotics for us to choose from. Our own school radio programme has become a very interesting forum. We love games. Every single day we play games – more so on weekends! This year 14 of us have reached state level in running, kabaddi, kho-kho and javelin. 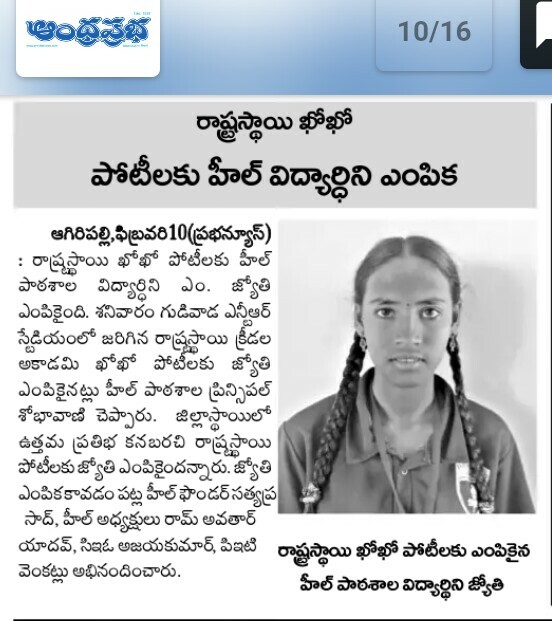 We are proud and happy to share that Ms. M.Jyothi, of 9th Grade, has been selected by the Sports Authority of Andhra Pradesh for advanced coaching in kho-kho. HEAL welcomes more and more volunteers. We are glad to share with you that 25% of both curriculum and co-curriculum is being taken care of by volunteers, from within India and overseas. In fact, our Paradise campus is steered by a volunteer – our CEO. Moving forward, we look for more of our esteemed supporters to volunteer. HEAL stands for Health and Education for All. Health comes through balanced diet. We are meeting a greater part of our nutrition requirements from organic farming in our kitchen garden and we are striving to increase the same. We are producing compost from our wet waste, managed entirely by our children. We have installed our new solar kitchen for steam cooking which will help us retained nutrition and hygiene. We believe in a healthy environment. We take pleasure and pride in keeping our dormitories, classrooms and campus clean. Alumni: We are very happy that some of our seniors have joined us today. They are our torch-bearers and role models. We profusely thank our teaching and non-teaching staff. They are not only our teachers, but they are our parents too. We, the HEAL children, humbly express our deep gratitude to our generous donors, covenants, sponsors, volunteers and well-wishers.